First of all, this post is not against light-rail transit-oriented development, but that it needs a better model if it’s to achieve its noble intended goals of increasing transit use while decreasing auto dependence. As you can see by the graph above, in light-rail transit-oriented development (TOD), there are a whopping 50% more households with two or more cars than the area average, and 20% less households with no cars than the area average. In other words, the current model of TODs targeting higher income home buyers is not triple-bottom-line nor sustainable. All graphs on this page come from Maintaining Diversity in America’s Transit-Rich Neighborhoods (page 31), published by the Dukakis Center for Urban and Regional Policy. The answer is simple and clear, transit-oriented development housing is too expensive, as you can see in the graph below. 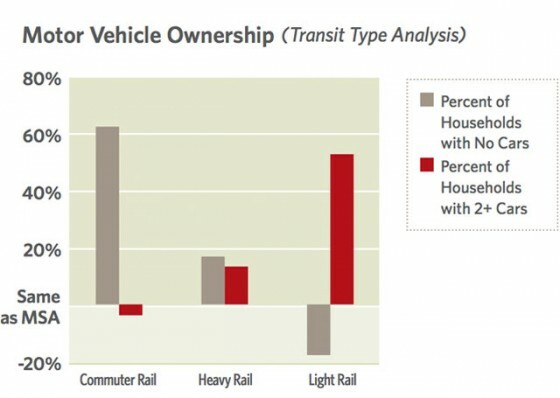 If the goal of a transit-oriented development is to increase transit use, it shouldn’t target its housing to those with higher incomes, since, not surprisingly, those with higher incomes tend to drive more and use transit less. 1. Not-so-big housing is not-so-bad. In fact, there’s a national movement to live in smaller, smarter homes – find examples here. 2. Unbundle parking. In other words, sell it separately from the home. The report outlines this in detail on page 53. It can save a triple bottom liner between $20,000 to $40,000 a year, not to mention a lot of other things in the other two bottom lines (ie jobs, nature, quality of life).